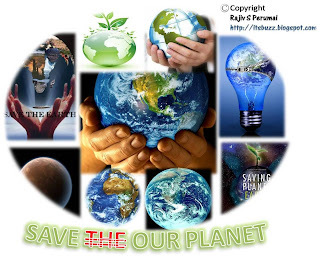 For the Greater Good: Save the Planet, Your Planet! A common phenomenon all our lives is the fact that when we grow up and have a room of our own, we take care of the room and bear ownership of it, but the rest of the house can go to the bin and we would be least bothered. As time goes on we grow up and buy a house, and now we elevate from ownership of the room to that of the whole house. Normally the elevation should go on, but instead we change from ownership of a house to that of houses. Hence always 'Mother Earth' which is the greater home of ours is always the one losing out. I'm not blaming anyone, as most of us (including myself) are no exception to this phenomenon. On the other end of the spectrum, just a few days ago the world's most powerful man Obama addressed the G20 summit with one of the key issues there being the 'Global Climate Change'. 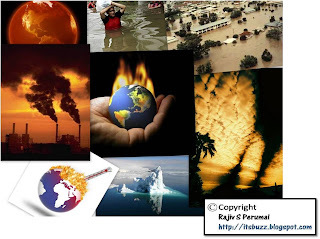 Its a matter concern that there has been a drastic change in the climate. Unusually horrendous storms and natural disasters seem to rock mother earth once in every 2-3years. And all of a sudden everyone is talking about the need to address this issue. India is no exception to this. Roughly a couple of month ago, a majority of the northern states in India had announced that there was a drought owing to less than normal rainfall. Southern states saw some rainfall but still weren't content and had power cuts. Well all that has changed so drastically that nowadays the headlines in every newspaper in India talks about the worse floods in over 106years in the two Indian states, Karnataka and Andhra Pradesh. Surprised? Don't be! As this is pretty much what we must be ready for at the rate at which the climate is changing. There may still be a few who say, this is a Global issue and 'I can't do anything about it, let him/her do it then I'll think bout it'! If you have an unused garrage space in your compound, instead of converting it to a room for negligible rent. Convert it to an open space to make your compound more greener. Least by doing this you can surely have a clear conscience and feel good about it, and if all of us can do this small bit, it would be as Neil Armstrong earlier said: "A small step for man, but a giant leap for mankind"! Pardon me if I sound too stereotype and if this sounds like boring advise,(or gyan in desi style) but people this is more of a plea or a request. Else all of mankind may eventually fall! "Musharraf is no more bereft of what he deserves"